Write your application logic in Java, use HTML for your UI and deploy anywhere! 2014-06-18 03:55:31 jpirek Old version of binary has verification and version is still verifable - removing it now. User will have to apply again. 2014-06-16 05:35:37 jtulach Old version of binary has verification and version is still verifable - removing it now. User will have to apply again. 2014-02-20 11:05:15 jtulach Old version of binary has verification and version is still verifable - removing it now. User will have to apply again. This set of modules provides a project type (based on Maven - e.g. it downloads half of the whole internet when used for the first time) that allows everyone to create a hybrid HTML and Java application and deploy it to desktop, browser, iOS, Android. 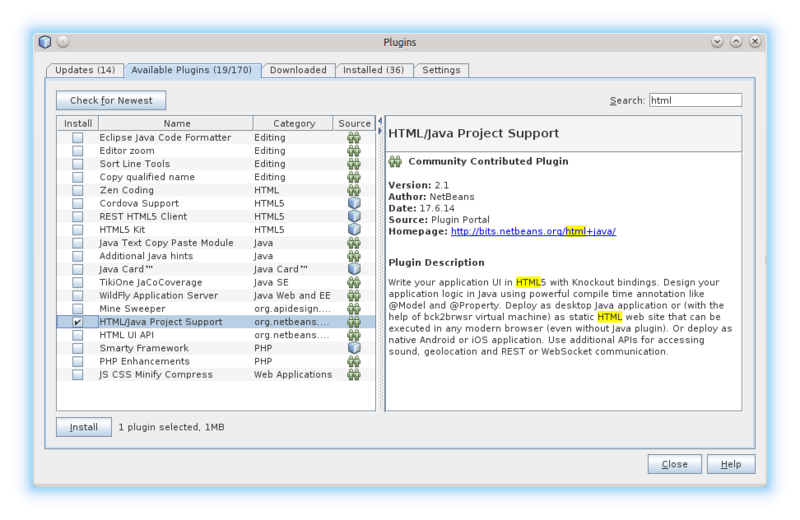 Use File/New Project/HTML/HTML with Java Application Logic as illustated in the tutorial. Write your application logic in Java and render the UI via HTML. Distribute as classical Java desktop application or as a set of static web pages that can be executed in any modern browser (even without Java plugin installed!). Or package as IPA or APK or NBM. Run the same (e.g. Java) code on your thin HTML client as well as server. Share for example validation logic and the classes for JSON or WebSocket communication. Join the effort at our project home page and enjoy Java running everywhere! A lot of dependencies are not fulfilled with current Netbeans 8.0: requested version >= 0.9.0 but only 0.8.2 was found.